Coffee is something that most people develop a taste for sometime in high school or college. In fact, your parents might not have let you drink coffee as a kid. They may even have told you that coffee could stunt your growth or have other negative side effects (besides caffeine-induced hyperactivity) to discourage you from drinking it. But have you ever heard of a study where those claims are proven alongside all those studies that show that coffee can actually be very good for you? The answer seems to be that the claims that coffee is harmful to kids are rooted in pseudoscience and marketing – marketing created by the early 20th century cereal Tycoon, C.W. Post who wanted to get kids drinking his cereal-based, caffeine-free coffee substitute, Postum. Rules about health claims in the early 20th century were quite different than rules today, so to make Postum (which is tasty, for those who grew up on it) sound appealing, Post just needed to make the competition sound terrible. 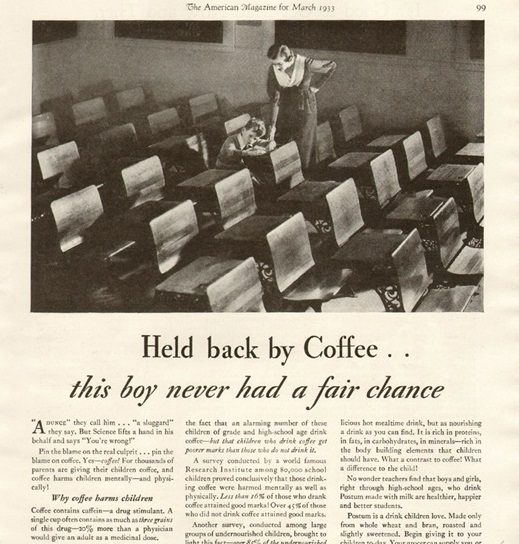 Ads stated that “a ‘world famous Research Institute’ had found conclusive evidence that drinking coffee brought down children’s grades” and that it generally “hampers proper development and growth.” It wasn’t a hard sell for caffeine-drinking parents, who did know that excess caffeine consumption could cause one to become jittery, and parents gradually stopped giving their kids coffee and tea with their breakfasts. They didn’t all switch to Postum, of course, but the impact of this campaign is still being felt today and it may continue to lurk in old wives’ lore for decades to come. But, rest assured, drinking coffee isn’t going to keep kids from growing an extra 2-3 inches or keep them from getting good grades. In fact, a little caffeine might just help them concentrate enough to memorize a few more facts for that upcoming test.